A Secure Roof for Winter and Fall – New Jersey Siding & Windows, Inc.
As summer draws to a close, it’s time to start thinking about preparing your home for colder weather—and the roof is no exception. Cold temperatures, wind, increased precipitation and ice can all take a toll on your roof. It’s better to take care of any issues now, so that you don’t run into bigger problems later on in the season. Here are a couple of things to add to your to-do list as fall approaches. 1. Clean the Gutters. 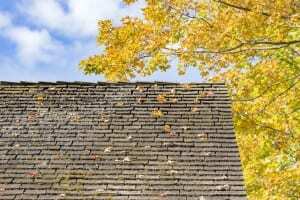 While fall leaves may look beautiful, they’re not so great for a roof. Be sure to clear your gutters of leaves and any other debris, especially if you have tall trees near your home. Debris can backup and clog the gutters, causing rainwater to overflow and damage the roof. 2. Inspect for Damage. If your roof is older or has recently gone through a severe storm, there’s a chance you may have some missing or damaged shingles. This could indicate that the roof isn’t as secure as it could be in order to withstand the upcoming winter weather. 3. Replace the Roof. Now’s a good time to replace the roof if you’ve been thinking about it for a while. For extra protection, choose shingles with resistance against impact, algae, temperature and moisture, as well as ones that promote good ventilation. 4. Install an Ice and Water Shield. Installing an ice and water shield, an adhesive rubberized membrane, around the edge of your roof ensures that ice damming, and other moisture related issues, won’t arise. Need Help Ensuring Your Roof is Secure Come Winter and Fall? Serving all of Northern and Central NJ, New Jersey Siding & Windows, Inc. is here to help make your roof as secure as possible. Contact us today for more information.